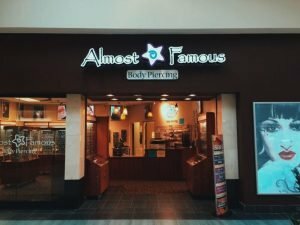 Almost Famous Body Piercing is growing to meet customer demand and we’re hiring at all six of our studio locations. 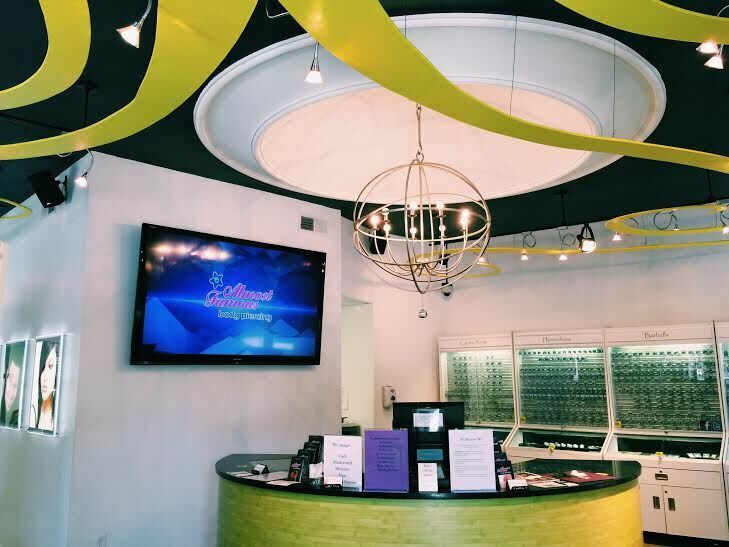 If you’ve ever considered a career in piercing, we would love to answer any questions you may have on hiring, training, and becoming a professional Body Piercer. You can visit the ‘Careers’ section of our website or stop into any of our locations to fill out an application or just ask questions. With our training, we can help you start a career in body piercing. For customers, our growth means more places than ever to provide piercings and bring you our great selection of basic piercing and replacement jewelry. We have six Almost Famous locations in North Dakota, Minnesota, and Illinois. Keep reading to learn more about our body piercing shops. Our Fargo Almost Famous location is in the West Acres Shopping Center at 3902 13th Ave S. For ease of access, park next to Chili’s on the north side of the mall. We’re located just inside the Chili’s mall entrance next to EverEve. Our hours are 10:00 am to 9:00 pm Monday through Saturday and on Sundays from 12:00 pm to 6:00 pm. Our Fargo location was actually our first! It opened up in 2003 and had one piercing suite. By 2005, our success and popularity with piercings was growing and the Fargo store got a remodel and a second piercing room was added. If you’re in St. Cloud area, we’re located at the Crossroads Mall at 4101 Division Street. We’re located between Target and Macy’s making the Target parking lot on the north side of the mall the ideal parking spot. We’re open from 10:00 am to 9:00 pm Monday through Saturday and on Sundays from 11:00 am to 6:00 pm. Our Mall of America location is hard to miss. Located at 350 East Broadway in Bloomington, we’re in suite 350 on the third floor between the elevators and the south (main) food court. To make parking easier, be sure to park on 4th floor of the parking ramp which enters into the 3rd floor of the mall. Take a left once you reach the elevators to find our studio. Our business hours are Monday through Saturday 10:00 am to 9:30 pm and 11:00 am to 7:00 pm on Sundays. For customers and job seekers in Northeast Minneapolis, we’re located at 405 Central Ave. in suite 110. Facing 4th Street and Central Ave there is metered parking all around our location. Free parking is also available on nearby streets and the St. Anthony Falls parking ramp. Our hours are 12:00 pm to 8:00 pm Monday through Saturday. We look forward to meeting you and feel free to call us at 612-354-7220 for more information. 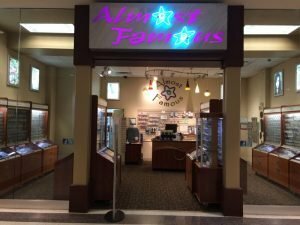 Our Mankato location is located at the River Hills Mall on 1850 Adams St. When looking for parking, follow signs on Highway 22 and Highway 14 to direct you to the mall parking lot. We are located in Suite 130 right near the Target and next to Mia & Maxx Hair Studio. Our business hours are Monday through Saturday 10:00 am to 9:00 pm and 11:00 am to 6:00 pm on Sundays. 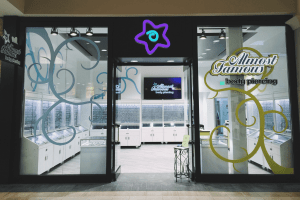 Our Champaign piercing shop is our newest store and is conveniently located at Marketplace Mall right near the food court at 2000 North Neil Street just a few miles away from the University of Illinois at Urbana-Champaign. With plenty of parking, the best entrance is the Food Court entrance. 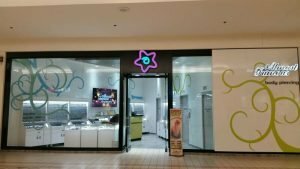 The Champaign store just opened in October of 2016! We’re so excited to bring an Almost Famous Body Piercing location to the Champaign/Urbana and surrounding areas community. Come and visit us soon!